In times when support is essential, and when the town becomes a place where daily life and tourism can be enjoyed, I want people to remember and watch over us:PROJECT 2 DONATE:WA WA PROJECT-Social Creative Platform for Opportunity-Know and support projects in eastern Japan ! Established after the earthquake on 28th April in order to bring back the "connections, bustle, and closeness" of disaster-struck localities and communities who have a will to self-recovery. Aiming to restore communities through the efforts of their own residents, they provide information on financial support necessary for the establishment of community businesses. Also, in order to gain ideas and funds necessary to reopen businesses in the community shopping arcades, they are also acting as intermediary between other support groups. Hereafter, they are planning to engage with groups not only in Iwate, but also in Miyagi and Fukushima Prefectures. There is a wide spread problem of local shopping streets losing business and becoming "shutter" streets. The shopping arcade of Kamaishi is no exception. This prompted the sweet shop owner Kano to initiate the Riasu NPO Support Centre 7 years ago. At that time the concept of an NPO was not so well known, but they began to hold regular events in the arcade, publish a newsletter and tried to distribute information to the outside. And it was as they were holding a seminar about how to make the town more fun and support local businesses that the earthquake and tsunami wrecked havoc upon the neighbourhood. "A tsunami wave over 5m high is beyond imagination. When I saw buildings collapsing before my very eyes I felt as if I were in a movie. And even now I still question whether this is reality." Facing such conditions Kano initiated on 29th April, along with other colleagues from various NPO groups the "Iwate Solidarity Regeneration Centre" for the purpose of the renewal of the town by the locals themselves. "We had lost our homes and the town was in a wretched state as we survived in evacuation centres. But many people came to offer their help to the affected areas. And it was with this that we came to think as leaders of community development we can not just sit back and do nothing. We must do anything that we can to help the situation. And so that is how our activity began. The NPOS active in the prefecture did not know about the situation outside of their own areas, but they could have the resources, funds, know how and ideas for how to restore businesses and regenerate another town. "Iwate Solidarity Regeneration Centre" therefore came to take the role of linking the various locals who were active in the field of community regeneration, while also taking on the important role of distributing information in order not to forget what has happended. "We want to tell people outside the region about the current present of the affected areas. We want to tell people about how far we have already restored the town and also prevent people from forgetting the incidents which have befallen us. We also receive many enquiries from people who want to come and see the conditions and want to offer some form of assistance, but many have various situations in their life and their work which prevent them from coming. I call such people "sufferers of the heart". I want these people to wait just a little more. When we attempt to restore the appeal of this town we will of course have things which we would like help with. When we need support we will of course call for it. So I ask that you don't forget us and continue to keep us in your thoughts." 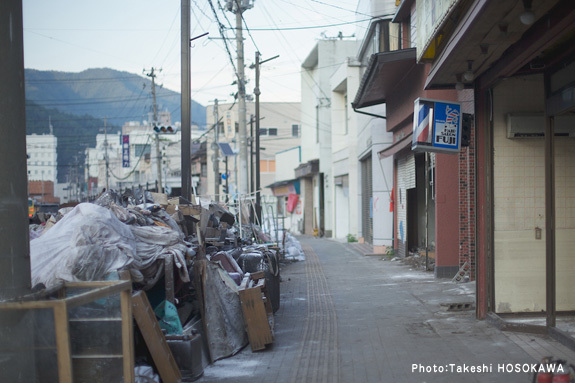 With various support groups and the hands of those wishing to restore the town, the centre began its activity in Kamaishi. Kano states that he wants the people of this town to hold a desire such as "I want to the town to become like this.."So what is Kano's wish? "It was a terrible tsunami but I have not come to hate the sea, and so I want to create a town where we can appreciate its magic. But I also want to create a town where there is no further death. There will of course come again such destruction. And at such a time it will be impossible for humans to defend themselves against the force of nature. If there is a way for people to escape, if there was a way to establish such means then we would not have to face further death. I want to create a town where tourists can feel comfortable and where we can pursue an enjoyable life. I also want to create a town where if any disaster happens there will be no loss of life." Along the shopping street which extends from Kamaishi station to the coast, people come and go and we can clearly see that in order to activate the town a regeneration of the shopping street is indispensible, but in order for shops to open they require various utensils and furnishings and other such materials. In this reality what is the most necessary thing? "In our shopping street we have a clothes store, photo store, barber shop, butcher shop, many different kinds of store. What they most need are support resources in order to restore their businesses. If you are in the same kind of business I am sure you will understand, but for equipment and resources needed for specialist work are rather costly. So if you have such tools available and are thinking how you can help, please contact to me." 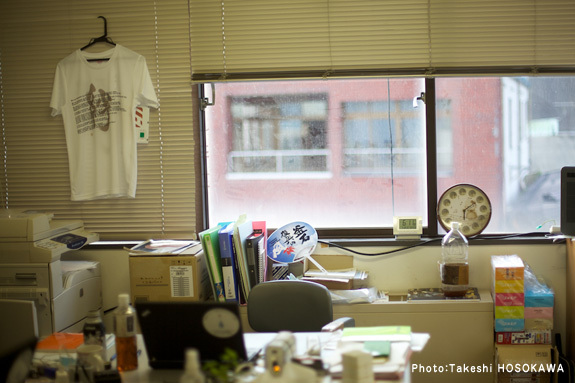 The office of Iwate Solidarity Regeneration Centre, Kamaishi. Connecting local residents with support groups. 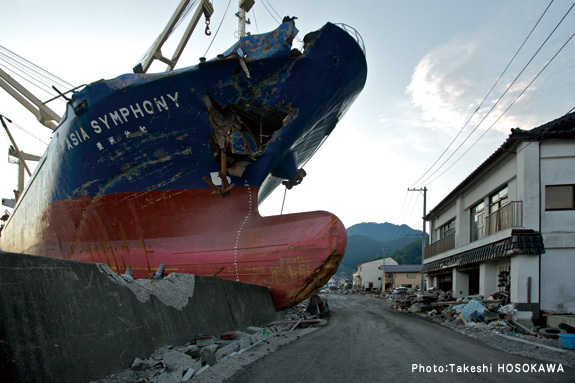 A large tanker, marooned by the tsunami. This was removed 7 months after the disaster in October 2011. 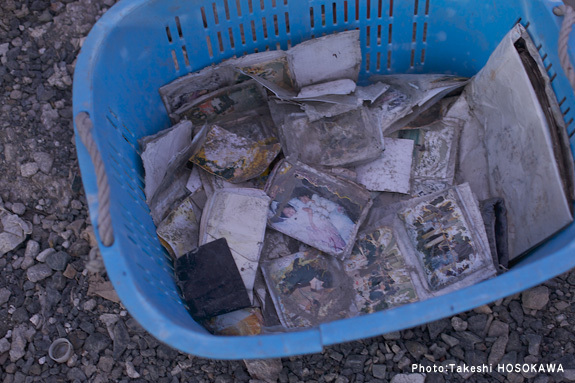 Photos gathered in front of a house reduced to rubble. Kano has started the "Regeneration Camera" project aiming to record the town which will be built from now on. The shopping street which was once filled with many different kinds of business before 3.11. Iwate Solidarity Regeneration Centre is working towards the revival of this area.